Chapter 2 is about improving communication and collaboration skills with parents. As any teacher knows, effective communication is not always easy. It requires focus, patience, energy and skill. Ernst also stresses how important it is to be reflective: we need to pay attention both when communication goes well and when it goes poorly. If we learn to communicate effectively and with compassion, then we can begin speaking from "our truest, most powerful selves". 1. Always be mindful in daily communications. Be present. Give the other person all your attention. Being mindful helps us make connections, learn how others are thinking, explore new solutions, represent our best selves, and communicate with respect. 2. Learn to develop accurate perceptions. Since our perceptions (or schema) are built on past experiences, they are often infused with emotion and not completely accurate. As teachers, we need to take a close look at the emotions evoked during difficult communications and then take the time to figure out whether the "perceptions that triggered the emotions are in fact accurate or erroneous." 3. Learn to actively listen. We teach this to our kids all the time, but sometimes it's easy for us to forget to listen carefully when we're rushed or worried or emotionally involved. Ernst reminds us to look at and listen to the speaker, beware of body language, and always use appropriate language. 4. Use seeking and verifying skills. In other words, we need to listen carefully to gather information, and then use that information to ensure we clearly understand. This can be done through questioning, clarification, validation and summarizing. 5. Adopt a clean slate perspective. Ideally, we want every interaction to feel fresh, to be free from bias. To do this we must avoid making assumptions and "mindfully seek explanations for behaviour". 6. Use joining and supporting skills. This is about adding our own ideas to the speaker's, and trying to reach consensus on how to proceed next. It also involves being aware of the person's needs and offering support as appropriate. 7. Learn to resolve conflicts. It helps to think of conflicts as differing perspectives, rather than me versus them. Ernst advises us to acknowledge those differences and then attempt to operate from the "third space". She defines this as a new perspective based on shared views: "when resolving conflicts, adopt a spectrum of potential solutions rather than an either-or outcome." For the most part I feel as though I'm very mindful and respectful in my communications with parents. I believe I also successfully operate from the third space when faced with conflicts. But what I struggle with, and I'm sure I'm not alone, is remembering not to make assumptions so that I can build a totally accurate picture of the situation, especially with those people with whom I've already experienced a less than positive encounter. I sometimes find this difficult to do, as my feelings are on the surface and I let my emotions get in the way. So far, I'm really enjoying this book. The information is delivered in a straight forward manner with lots of anecdotal stories to add clarification and interest. I feel as though I'm picking up some great tips! What do you do well in terms of communication? What would you like to improve? Any tips? Disclaimer: Gryphon House gave me a complimentary copy of this book. The opinions I share are wholly mine. Oh yes, I'm guilty of assumptions too. In fact, just yesterday I was making one about a parent who didn't reply to one of my emails. It's hard not to do this in just general life too. I have to work on always being prejudiced in others' favor. 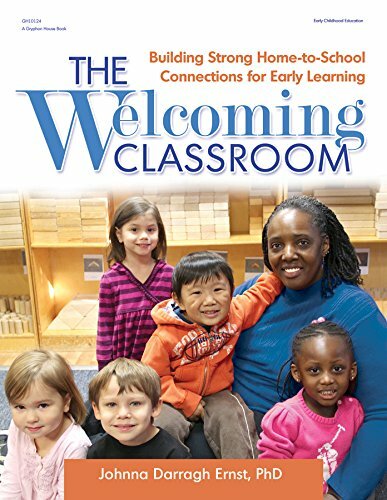 This sounds like a great book to help build relationships with parents. That is an important part of our jobs, but doesn't really seem to get that much attention in our training. Thank you for this post! What great things to think about. I'd love to read this book. I try very hard to form strong bonds with my student's families. I want to create a network of strong support for all of my learners. Thanks for sharing your insights! I think you'd probably really like this book, Jenny. It's written in a non-judgmental feel-good kind of way.